Win Duckman: The Complete Series: Adults-only animation from the 90s now on DVD | SWITCH. Duckman isn't your average suave, sophisticated private eye. In fact, he's rude, ignorant and slovenly, and he barely manages to solve enough cases to cover his alimony payments and cable TV bills. Down these mean streets a duck must walk. This DVD collection features all 70 episodes, and features the voices of Jason Alexander, Elizabeth Daily, Nancy Travis. The 'Duckman: The Complete Series' competition has now closed. Winners will be announced shortly. Competition opens at 5pm AEDT on Sunday 18th March 2018 and closes at 11:59pm AEDT on Sunday 25th March 2018. Five winners will be chosen at random on Monday 26th March 2018. To successfully win, entrants must fulfil the above entry conditions before the time the competition closes. Current members/followers are eligible to enter the competition. Only one entry per person. Only one winner per household. To be a valid winner, the entrant must not have won a prize from SWITCH within the last 28 days. Each winner will receive one DVD copy of 'Duckman: The Complete Series'. By entering, you agree to receive occasional emails from SWITCH in the future. If you decide to unsubscribe from these updates, any further entries will not be applicable. Only Australian residents are eligible to enter. 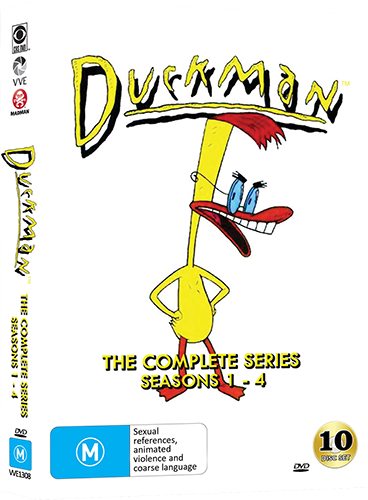 'Duckman: The Complete Series' is available on DVD on Wednesday the 21st March 2018 from Via Vision Entertainment.